Seascape is (at least for me) extremely difficult I have been working on it for years and it still feels really experimental. I am very comfortable painting in front of nature, painting the sea is a whole different animal. My experience is that a surf painting has to be invented in the studio. Sketches can be done on location, and a lot is learned by doing that, however when you see a Waugh, it is a studio painting. If you really set up in his vantage points the incoming wave would probably kill you. I am going to lay out a basic explanation of the biggest idea in painting water. WATER IS A MIRROR, BROKEN INTO FACETS THAT ARE OF DIFFERENT VALUES DEPENDING ON WHAT THEY ARE REFLECTING. Above is a Waugh, and below I have clipped a passage from the foreground to illustrate what I mean. In this example, the water is reflecting the sky on the planes that are "level" or what I call the "floors". The broken mirror facets on the "floors' reflect the sky pretty well, but not perfectly, they subtract some percentage of the light they receive as some of it passes down into the water. So they are darker in value than the sky. The facets or planes of choppy water look a little like a mountains slanting surfaces rising up from a broad base in a tapering pyramid shape. Each of those planes either reflects a different part of the sky or is in shadow. Those facets which take no light from the sky, that is, stand between us and the light, are the darkest. The more vertical the facet, the darker they will be. Seascape painters frequently use a back light because it simplifies the representation of the wave structure and it looks wicked cool. Remember that the world of the shadow is always darker than the world of the light. That means there will be a dark line bounding the top of the wave and the smaller little "mountain spurs" riding on it. That line will be the darkest thing in the wave. You will need to work with at least three separate values to explain the structure of the wave. Those are needed for the shadow, the less vertical planes which are taking less light and the floors or surfaces which reflect the sky most. If you look at the detail below you can pick out these three values. I will talk a little more about the structure of the "chop" in the next post. 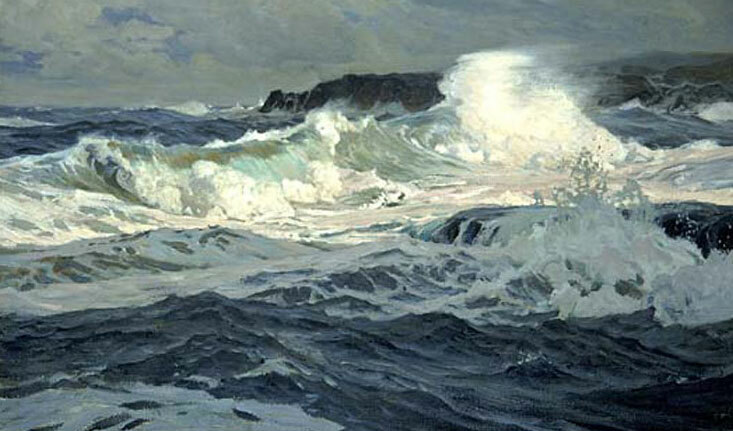 John Robinson is one of the marine painters who was influenced by Waugh, and continued to pass on his teachings. I have always loved Frederick Waugh. 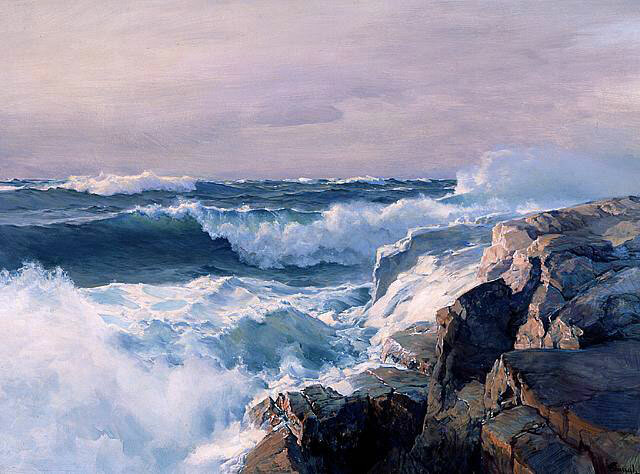 He was one of the great marine painters of the past century who inspired a generation of art students.